It is 11:27 p.m. in Iowa, which makes it 6:27 a.m. in Rome. It is dark in Italy, as it is here – I don’t imagine this. I can watch the early morning unfold in darkness there via webcam broadcasting from the Campo dei Fiori just as easily as I can see the night outside my own window. It is so quiet in both places. I feel like I am alone with my thoughts on two continents at once. When I first click on the campo’s camera feed, the market square appears empty. Then I see a solitary person, like me, wander into view. All in white, he or she walks silently along the market stalls, then disappears underneath an awning. I am suddenly alone again. Alone but for a figure in the very center of the market square – a statue of Giordano Bruno, last convicted heretic to be burned alive by the Roman Inquisition in 1600, here in the Campo dei Fiori. He looms over the square. In the dark, I cannot tell if he looks my way or has his back to me. As I watch, the day begins to break: trucks and handcarts arrive, people appear with them to unload merchandise. I see flats of produce (tomatoes? eggplants? ), and a man passes through my view with heavy, oblong bags slung over both shoulders. More stalls are erected, I begin to hear people calling to one another, glass bottles clink loudly one against another. Birds caw out raucously. By 6:47 a rosy sunrise is just visible over the roofs of buildings that enclose the square, slowly revealing a skyline that is both foreign and, somehow, familiar. Once I read a book in which Giordano Bruno was a character. The day after I finished this novel, I browsed a local bookstore, discovering a book containing a cycle of poems about his life. I thought that was an interesting coincidence, until later that same day, I picked up a thick volume of poetry by the Polish writer, Czeslaw Milosz. I opened the volume to a random page and the title staring up at me was “Campo dei Fiori”. This string of coincidences has stuck with me. Tonight, I wonder if it holds a message. Giordano Bruno: scientist, heretic, believer in an infinite universe, burned alive for his convictions. I told a priest friend this story and he said, “I won’t discuss him and I heartily encourage you to stay away from him.” As if we still live in a time when ideas are worth dying for; are worth killing for. 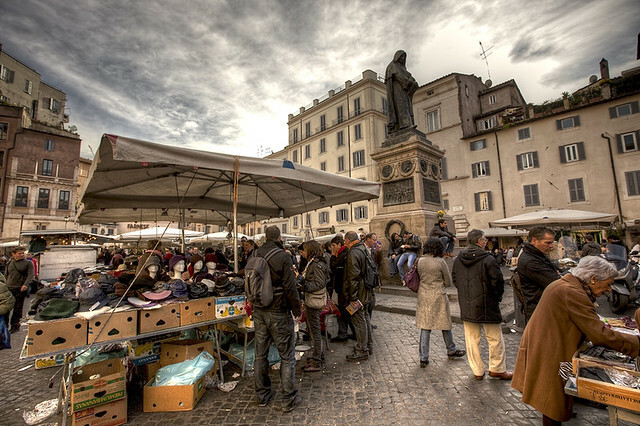 Try as I might, I can’t quite get there – to this new Campo dei Fiori. It feels like we are living in the same old marketplace, a carnival to distract us from the fires in which people are dying. Some days we pause to notice ashes from the burning float past us, but most days we just keep keeping on. We might think “this isn’t right”; maybe we’d like to stop the world and get off this sicko ride, but the ferris wheel keeps relentlessly turning and our choice is ride or jump. We fear the free-fall that follows the jump more than we fear the impact of the ground (though, to be honest, we don’t relish the thought of either). So we ride, around and around mumbling the same argument, the same complaints. As night deepens where I am sitting, day is already moving on in Rome. I check the webcam and note that there are shoppers beginning to drop by the market stalls. I hear the murmur of their voices, though I cannot make out any words. My eyes follow a bird that swoops in above the awnings, flying straight toward the towering figure of Giordano Bruno. Just in time, the bird rises, avoiding a collision. That is when I notice it is bright enough to see that Bruno is facing me. Even though his face is shadowed by the hood of his robe, I imagine that our eyes meet. Behind his shines the light of a thousand thousand stars. Right or wrong, he stood his ground; is standing there still.